The parade is produced by the West Seattle Rotary Service Foundation. Still more to show! 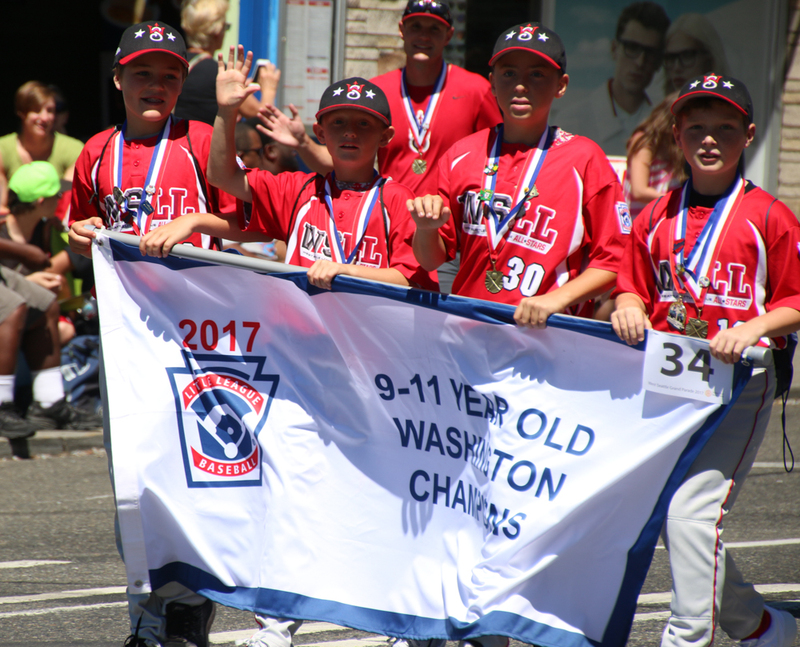 And if you enjoy parades in general – the Jubilee Days Parade is happening today in White Center, 11 am start from 16th SW/SW 112th, heading north on 16th SW to SW 100th. Still a few more parade roundups to come! VIDEO, PHOTOS: West Seattle Grand Parade 2018 winners! | Comments Off on VIDEO, PHOTOS: West Seattle Grand Parade 2018 winners! 3rd Place: Washington Diamonds Drill Team Jr. Thanks to the parade team for sharing photos of some of the awards being accepted; otherwise, all photos/videos above are ours. In the hours ahead, we will add to this report with photos/video of more of the winners, and we’ll publish several other parade roundups, too. VIDEO, PHOTOS: See first-ever West Seattle PAWrade, and the winners! And yes, says WSJA executive director Lora Swift (grand marshal of today’s Grand Parade – much more GP coverage to come), there will be another PAWrade next year! 10:49 AM: The 2018 West Seattle Grand Parade is on! The Seattle Police Motorcycle Drill Team has taken off, with the Vancouver B.C. PD motorcycles following – and then after a bit of a pause, the rest of the parade (with the PAWrade in The Junction in the meantime). Watch our Twitter feed for updates (you can access it via the Web – you don’t have to be a Twitter member); we’ll also update this report when the parade has concluded and California SW has reopened. 12:11 PM: After an hour, the parade has ended at the start line – the parade coordinators, judges, and chair are traveling down the street at the end. But it’ll be a while until the conclusion in The Junction (we have a crew there too). 1:10 PM: The parade is now over at the ending point (California/Edmunds), too. As always, lots more coverage to come in separate reports, with photos and video. Michelle Edwards and Jim Edwards – who rides the route before, during, and after, coordinating communication with amateur-radio operators – of the parade-coordination team were conferring, steps from the tent bearing the logo of the Rotary Club of West Seattle, which presents the parade. Also present, SFD and SPD – Engine 29 from nearby Ferry Avenue SW is a parade entry. We also saw Southwest Precinct Operations Lt. Steve Strand, who, while currently in his SPD uniform, will be changing pre-parade, he tells us, to ride as commander of the West Seattle VFW post. Remember that California is now closed along the route, south of Admiral to north of Edmunds, and will be until the parade concludes around 1 pm. More updates to come! This is the only US appearance for the Vancouver B.C. PD drill team every year. They’ll follow the SPD team. 10:35 AM: The motorcycles haven’t left yet. We’ve seen another car towed, though! Still room to sit, even here at the head end of the route – even on the Hiawatha slope over the sidewalk. We’ll post a separate story once the parade has begun, and we’ll also add a few more pre-parade photos to this one later. HONOR GUARD: This year, instead of a military honor guard, you’ll see a Boy Scout honor guard carrying the flags at the start of the parade – Troop 284. GETTING READY: Longtime WSB sponsor Potter Construction is also a Grand Parade sponsor and entry, and sent the photo after decorating the truck that’ll roll down the route tomorrow morning. Prizes! Glory! And/or, just plain fun. You and your dog(s) can just show up at the starting spot – 4400 California SW – after 10:15 but before 11 am tomorrow and be part of the PAWrade right before the Grand Parade. Here’s the latest info. ROAD REMINDERS: California SW will be closed, from just south of Admiral Way to SW Edmunds, from mid-morning until all parade entries have cleared the route (usually just after 1 pm). Side streets will be used for staging, so if you’re seeing parking restrictions tonight, heed those too. Bus reroutes are all linked from the Metro alerts page. Before the 70+ entries – and hundreds of participants – roar, roll, and march down California SW this Saturday (July 21st), a lot of planning and coordination is required. Including the lineup meeting, which happened at American Legion Post 160 in The Triangle this past Monday night. What you won’t see: The pre-parade Float Dodger 5K is on hiatus this year. Who’s announcing: If you’re watching in The Junction, you’ll hear the voice of West Seattle’s own longtime broadcaster/journalist Brian Callanan. How long does it last? The motorcycles go first, sometime after 10:30 am. The PAWrade will start from California/Genesee at 11 am. The parade generally ends around 1 pm (sooner of course if you’re watching toward the start of the route in The Admiral District). The VIPs out of the spotlight: Besides the parade coordinators and assistants at the start of the route – including help from Seafair – the West Seattle Amateur Radio Club will have radio operators all along the route (led by Jim Edwards, who travels the route on motorcycle) in constant communication. And the judges (led by Barbara Edwards) will be at various spots along the route – the winners are announced later in the day and as always, we’ll publish the list. See you at the Grand Parade – a West Seattle tradition since 1934! P.S. Saturday’s bus reroutes are linked here. COACH VELKO GETS HIS TROPHY: At tonight’s West Seattle Big Band Concert in the Park, this year’s Orville Rummel Trophy for Outstanding Service to the Community recipient Velko Vitalich accepted the trophy, with which he’ll ride in Saturday’s parade. The trophy was presented to the retired West Seattle High School baseball and golf coach by the Rotary Club of West Seattle Service Foundation‘s parade chair Keith Hughes, assisted by parade coordinators Michelle Edwards and Jim Edwards, who also happen to be with the WS Big Band (musician and director, respectively). 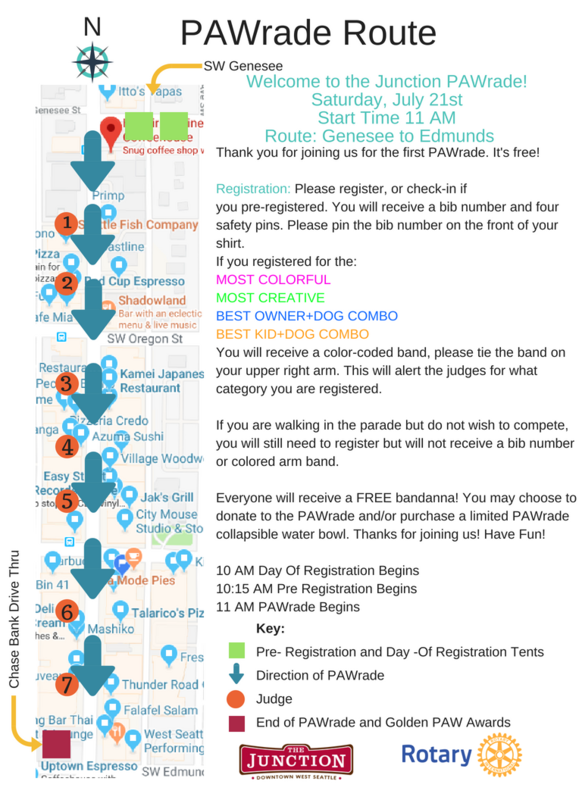 The West Seattle Junction Association and Rotary are teaming up to present the PAWrade right before the Grand Parade arrives in The Junction. Prizes! Judges for the categories shown above are from local pet-related businesses/organizations, and they’ll be stationed along the route. It’s a short one, so don’t worry about Fido fatigue – it starts at California/Genesee at 11 am, between the motorcycle drill teams’ conclusion and the arrival of the rest of the parade, and proceeds to California/Edmunds – then you can go back and watch the Grand Parade! Sign up here if you’re ready to commit, or just show up at the start on Saturday! TOMORROW: Next preview takes you to the parade lineup meeting! COUNTDOWN: 2 weeks to 2018 West Seattle Grand Parade (and Junction PAWrade)! | Comments Off on COUNTDOWN: 2 weeks to 2018 West Seattle Grand Parade (and Junction PAWrade)! P.S. New this year, as we’ve noted previously, you and your dog are invited to be part of the pre-parade PAWrade in The Junction! Meet up starting at 10:15 am at California and Genesee, and then PAWrade southbound through The Junction starting at 11. You can register that day BUT pre-registration is appreciated – you can do that online here. Free! Prizes! After six years of serving as an opening act for the West Seattle Grand Parade, the Float Dodger 5K run/walk on the parade route is taking a break this year. After a tip from Marion, we went over to West Seattle Runner (WSB sponsor), organizers of the Float Dodger 5K. Tim McConnell told us a variety of factors led to the decision to skip this year – including a late start to fundraising – which is a vital component, given permit fees and other costs – plus other business/family projects. But as you’ll see on the Float Dodger website, they’re organizing a casual run pre-parade: “Please join West Seattle Runner for a casual group run the morning of the parade on July ​21 at 9:30 am to run the parade route and watch the parade from the store afterward.” And they’re hoping to bring back the Float Dodger 5K in 2019. Get ready to march with your pooch(es) through The Junction before this summer’s West Seattle Grand Parade! It’s the start of a new tradition. In place of the Kiddie Parade, which hasn’t drawn much interest in recent years, the West Seattle Junction Association is launching the West Seattle Dog PAWrade. The whole family’s welcome to participate on Saturday, July 21st, 11 am, on California SW from Genesee to Edmunds. It’s free, but donations are appreciated – you can register starting now, and a donation gets you a collapsible dog dish or bandanna in honor of your PAWrade support. There’ll be trophies and medals – the categories are explained on The Junction’s official PAWrade page, which is also where you can go to sign up! One last gallery from Saturday’s West Seattle Grand Parade, before the weekend is completely over – more of the wheels! West Seattle Grand Parade 2017, report #2: The winners! | Comments Off on West Seattle Grand Parade 2017, report #2: The winners! 2nd – Washington Diamonds Drill Team Jr.
3rd – Washington Diamonds Drill Team Sr.
Congratulations to all! We’ll be adding more photos (and some sunnier substitutions) and video of the winners in the hours ahead, and publishing other parade galleries too. P.S. If you love parades … note that the White Center Jubilee Days Parade is tomorrow morning, 11 am, from 16th SW and SW 112th, heading north on 16th to 100th. 10:42 AM: The Seattle Police Motorcycle Drill Team is performing, and that marks the start of the 2017 West Seattle Grand Parade, From California/Lander in The Admiral District to California/Edmunds in The Junction. They and the Vancouver B.C. Police motorcycles perform before the rest of the parade, which is set to get going around 11, after hours of staging, practicing, and behind-the-scenes logistics by dozens of volunteers, from the parade co-coordinators, to the Seafair Parade Marshals assisting them, to the West Seattle Amateur Radio Club hams communicating along the route. This year’s parade is about the same size as last year – more than 70 entries, as of the lineup meeting we covered earlier this week – and that means it’ll likely conclude at this end around 12:30 pm, in The Junction after 1. If you’re watching on that end, also look for the Rotary Kiddie Parade leaving California/Genesee at 11. And watch our Twitter feed for parade photos and updates before our post-parade coverage! Lots more photos and video in our upcoming roundups – but first we’re off to some of today’s other big events. 1:11 PM: Our crew in The Junction reports the parade has ended. They ran around the West Seattle Rotary float – the Rotary presents the West Seattle Grand Parade, which starts with the motorcycle drill teams leaving California/Lander around 10:30 am. In past years, runners have “dodged” the Hi-Yu float, but since that organization has deactivated, a new local dodge-able float had to be found. Meantime, we’re told about 400 people were signed up for the 5K – and the first finishers already are crossing. Results later! And for continuing pre-parade coverage, watch the WSB Twitter feed. One more preview before the West Seattle Grand Parade arrives tomorrow (Saturday, July 22nd)! There are still some construction sites between the Admiral and Alaska Junctions, and some sites where construction has wrapped up since last year. So scout your spot early. DANCING DOWN THE ROUTE: Joyas Mestizas (file photo above) will be back. … and many others we’re out of time for mentioning – you’ll just have to see for yourself! And remember that the Float Dodger 5K precedes the parade – not too late to be part of it (9:30 pm start from Hiawatha track, 2700 California SW). PREVIOUS PARADE PREVIEWS (and coverage from the past decade) … scroll through this archive section. P.S. Even if you’re not going to watch, or be in, the parade and/or 5K … heed the no-parking signs you’re seeing along and near the route … road closures and bus reroutes start early Saturday and should be over by 2. P.P.S. The parade is presented by the West Seattle Rotary Club‘s Service Foundation. See our previous preview here. Just a few more days until hundreds of people comprising more than 70 entries will walk, roll, march, dance, and ride in the 2017 West Seattle Grand Parade, down California Avenue SW between The Admiral District and The Junction. COMEBACKS: The Seattle Chinese Community Girls Drill Team, one of Seattle’s most popular parade performance groups, will be back this year. Last year, they marched in the Renton parade instead, and while that parade is on the same day this year, the group is coming back to West Seattle. Also returning after sitting out last year: Luna Park Café. NEW: First-time entries include Camp Crockett (WSB sponsor). TWO-WHEELIN’ IT: The Vancouver B.C. Police Motorcycle Drill Team will again make their only area appearance, following the Seattle Police Motorcycle Drill Team. The Shriners‘ mini-bike unit is joining the parade, too. 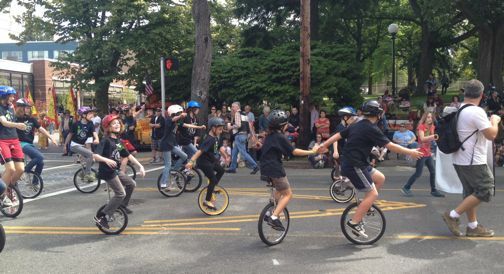 HUMAN-POWERED WHEELS: Participants include two roller-derby entries plus the Pathfinder K-8 Unicycles. BOOM: Yes, of course the Seafair Pirates will “sail” down the parade route. Cannon and all. FLOATING: Visiting floats will include the Daffodil Festival (Pierce County) and Strawberry Festival (Snohomish County) floats and Fathoms O’Fun from Port Orchard, right across Puget Sound from West Seattle. Remember that you will not see a West Seattle Hi-Yu float, as the organization has gone inactive. LEADING THE WAY: As we reported earlier this week, American Legion Post 160 Commander Keith Hughes is this year’s recipient of the Orville Rummel Trophy for Outstanding Community Service. Just announced as Grand Marshal, your District 1 City Councilmember Lisa Herbold, who lives in Highland Park. WHERE & WHEN: The official parade start time is 11 am from California/Lander. But the SPD motorcycles get going at about 10:30, so they and their Vancouver counterparts are done with their thrilling maneuvers before the Joint Base Lewis-McChord color guard leads off the rest of the parade. You can watch from anywhere along California between Lander and the end of the route at Edmunds on the south side of The Junction. The heart of The Junction is where you will hear announcements by emcee Alison Grande. TRAFFIC ADVISORY: The streets will close as early as 7 am. It’s not just California between Admiral (a bit north of the parade’s starting line, for staging) and Edmunds, but also streets to the west and east, where you’ll see NO PARKING signs already out, especially toward the start of the route. Please take the signs seriously so that the parade can happen without a hitch. BUS REROUTES: Five routes will be rerouted on parade day, 22, 50, 128, 773 (Water Taxi shuttle), and the C Line – you can find the information on Metro’s alerts page. BEHIND THE SCENES: The West Seattle Rotary Service Foundation presents the parade; many volunteers make it happen, including the four we observed at the lineup meeting – co-coordinators Jim Edwards, Dave Vague, and Michelle Edwards, and judges including Doreen Vague. The West Seattle Amateur Radio Club participates in coordination along the route on parade day. BEFORE THE PARADE: The Float Dodger 5K starts from Hiawatha Playfield at 9:30 am – if you’re not running/walking in it, you are still welcome to get to the parade route early and cheer them on … If you’re watching from The Junction, and have little one(s) in the family, they might want to be part of the West Seattle Kiddie Parade, leaving California and Genesee at 11 am, after the motorcycles and before the rest of the parade. Watch for a few more previews and reminders before parade day arrives! And if you’re going to be in it and want to share any advance info, editor@westseattleblog.com – thanks! Our West Seattle Grand Parade coverage dating back to 2006 is archived here.